Morikawa's hand: Five unknown units. Kai's hand: Four. Dragonic Overlord and there others. Twin drive unknown. Damage check unknown. Aichi's hand: Five. Marron, Mirubiru, Alen, Flogal(ST) and Giro. Kai's hand: Six. Bahr, Aermo, Dragon Armored Knight, Guard Gryphon, Dragonic Overlord and one other. Kai rides the Embodiment of Armor, Bahr(8000) and calls Aermo(6000) for support. This is something of a misplay because Aermo can't do anything right now, so it's better for Kai to keep his hand to himself. However, by having Kai do this Mr. Ito saved himself from having to draw Dragon Armored Knight losing -2000 power and then getting it back one panel later. Aichi's hand: Six. Marron, Mirubiru, Alen, Flogal(ST), Giro and one other. Kai's hand: Four. Dragon Armored Knight, Guard Gryphon, Dragonic Overlord and one other. Aichi rides the Little Sage, Marron(8000) and calls Mirubiru as his support. Marron's(14000) drive check is not shown. Kai damage checks Vortex Dragon. Aichi's hand: Five. Alen, Flogal(ST), Giro and two others. Kai's hand: Five. Dragon Armored Knight, Guard Gryphon, Dragonic Overlord and two others. Kai rides Dragon Armored Knight(10000). Knight's(16000) drive check is unknown. Aichi's damage check is unknown. Aichi's hand: Six. Alen, Flogal(ST), Giro and three others. Kai's hand: Six. Guard Gryphon and five others. Aichi calls Knight Squire, Alen(7000) to his rearguard with Flogal(5000) as Alen's support. Alen(12000) is guarded by Guard Gryphon(S15000). Marron's attack is not shown, but is presumed to have gone through. Aichi's hand: Five. Giro and four others. Kai's hand: Six. Dragonic Overlord and five others. Kai rides Dragonic Overlord(11000) and counterblasts 3 for its skill. Dragonic Overlord(16000) attacks Alen, then turns on Marron, being guarded by Giro(S18000). Aichi's hand: Five. Blaster Blade and four others. 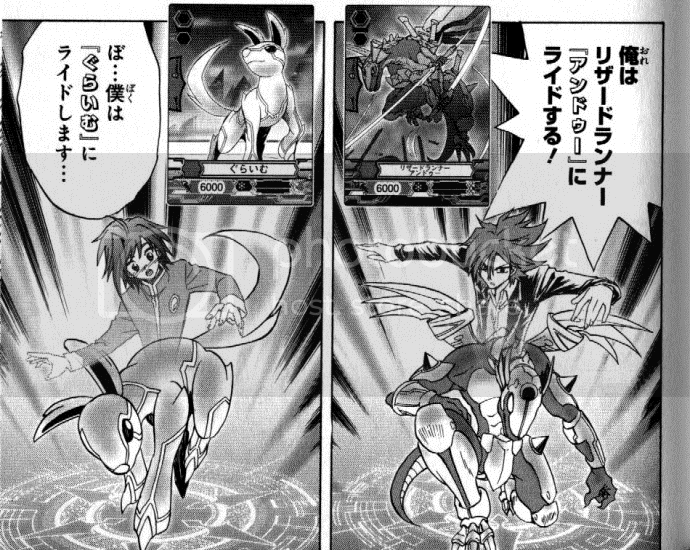 Aichi rides Blaster Blade(9000) and counterblasts 2 to retire Aermo. Blaster Blade(15000) attacks, his drive check is not shown. Several turns are skipped. Shown in Kai's damage zone is; Vortex Dragon, four unknown cards and another Vortex Dragon. Marron and Mirubiru's combo attack is called Bumble Ray. Characters from the world of Cray are shown to speak in katakana rather than hiragana. Basically, this shows that they're “foreign.” Characters from our world speak in hiragana even while assuming the vanguard. Dragon Armored Knight and Aermo's combo attack is called Fire Desire. Guard Gryphon's skill is called Shield Wing. Blaster Blade's counterblast is illustrated very differently from how the anime and later chapters show it. While it's a beam shot across the ground in the anime, and a beam shot from Blaster's blade in most of the manga, here it's shown as an additional attack that Blaster Blade makes on the enemy rearguard. Image is everything! Blaster Blade's attack is called Burst Buster.